Amboseli National Park is a place of stark contrast. Meaning "A place of water" in maa, language of the Maasai. 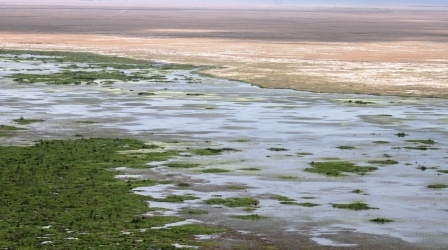 Amboseli, despite its sometimes dry and dusty appearance, has an endless water supply filtered through thousands of feet of volcanic rock from Kilimanjaro's snow-melt. These underground streams converge into two clear water springs in the heart of the park. The endemic dust is volcanic ash, which spewed from Kilimanjaro millennium ago. During dry seasons a curious feature is the shimmering dry lake-bed where false mirages of populated horizons, punctuated by real herds of zebra and gnu (wildebeest) hover in front of visitors. The principal attraction at Amboseli is its vast herds of elephants. The bulls have some of the largest tusks in Kenya. There are zebra, wildebeest, giraffe, impala and leopard, caracal and serval cat can be seen. Birdwatchers can see pelicans, bee-eaters, kingfishers, African fish eagle, martial eagle and pygmy falcon. 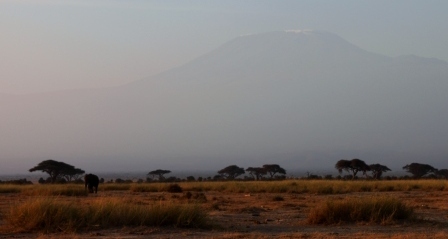 Amboseli is an important range-land in Maasai culture. The ranch areas outside the park offer a wealth of game viewing and walking safaris. The Kenya Wildlife Community Service works closely with local elders to develop eco-tourism attractions, which benefit indigenous communities and protect this fragile eco-system. Note: Come and discover the Amboseli Park with me!